Changing lightbulbs around the house? Trying to get that glass down from the top shelf in the kitchen? Time for spring cleaning? 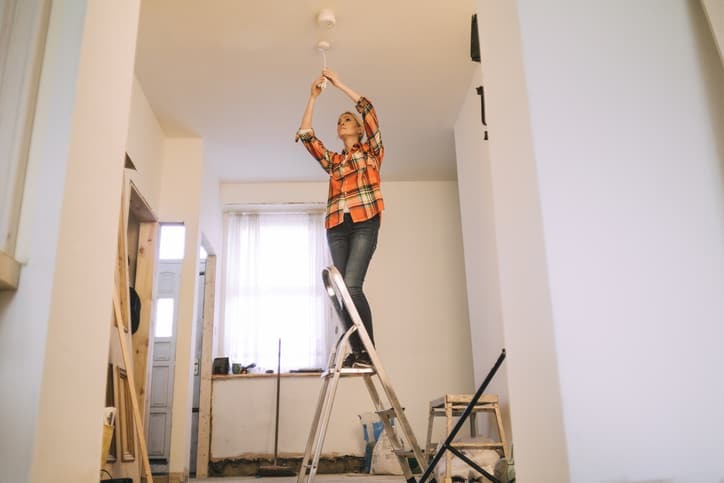 Don’t let accidents caused by improper use of a ladder detour your home project plans or make these simple tasks hazardous. National Ladder Safety Month, sponsored by the American Ladder Institute, offers resources to assure you stay safe when using ladders. National Ladder Safety Month is a great time to brush up on the basics. Ladders are an invaluable tool around the home, but more often than not, they are being used incorrectly. Missing that last step and overreaching are the two most cited causes of ladder accidents, according to a 2016 study by ALI. These accidents can easily be avoided by following basic safety precautions. ALI offers free, online Ladder Safety Training video training modules that you can watch at your leisure and apply immediately at home. These concise modules cover the proper selection, safe use, and care of the four most frequently used ladders—and successful completion of the subsequent test earns you a Ladder Safety Certificate. Access the individual modules and learn more about the complete certificate program. In addition to using the free resources and signing up for ALI’s free Ladder Safety Certification program, participants can find more ideas to participate using the official marketing guide. Ladder safety is important for everyone because it affects nearly everyone. Help save a life or avoid an injury by sharing the benefits of learning ladder safety using the hashtag #LadderSafetyMonth on social media and spread the word. Share how you’re participating in the awareness month by emailing ALI Headquarters, and ALI will feature you on its Participation Map.